WELCOME TO THE BEAUTIFUL MOUNTAINS OF NORTH GEORGIA AND WESTERN NORTH CAROLINA. HERE LIFE TENDS TO BE A LITTLE MORE SIMPLE AND LAID BACK. DOES THAT SOUND LIKE SOMETHING YOU NEED? 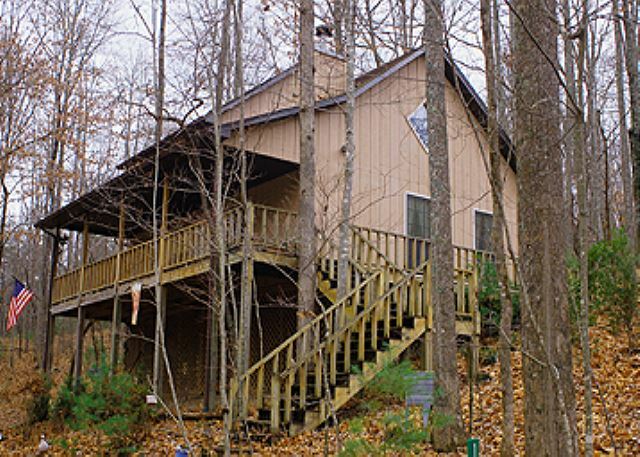 WE OFFER VACATION CABIN RENTALS IN BLAIRSVILLE, HIAWASSEE AND BLUE RIDGE, GEORGIA AS WELL AS HAYESVILLE AND MURPHY, NORTH CAROLINA. 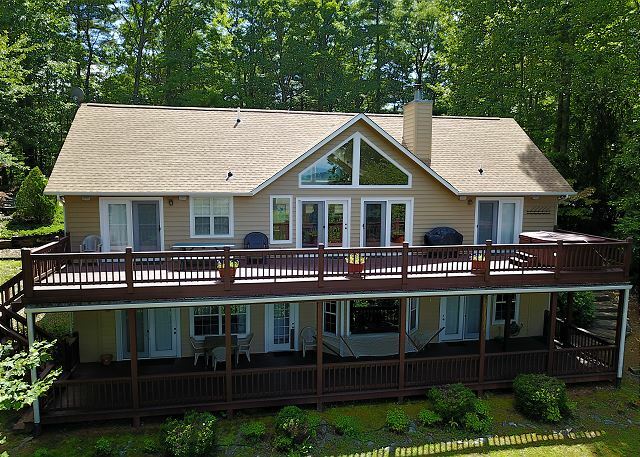 Looking for a great relaxing mountain getaway with easy access and privacy? This is it! Nice 2 bedroom 2 bath cabin with large hot tub, Mountain Views, Internet and privacy. This cabin is nestled in the middle of several acres and backs up to National Forrest. Great cabin to get away to and relax. Bear Creek Cabin is located in the Beautiful Track Rock Area of Blairsville and is just a short 5 – 6 mile drive to Blairsville and is conveniently located to many attractions in the area such as Brasstown Bald Mountain, Helton Creek Falls, Vogel State Park, Track Rock Stables, Crane Creek Vineyards, Shopping and much more. 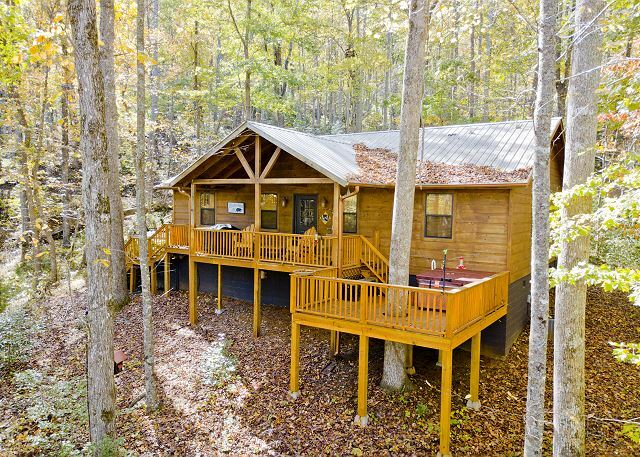 It is also just a short drive to Young Harris and Hiawassee, GA.
Get away to the Mountains and Enjoy a Great Pet Friendly 2 bedroom, 2 bath cabin with Hot Tub, Internet access and only 22 miles to Helen, Georgia. Easy Access with covered porch. Relax and enjoy a Relaxing Vacation cabin in the North Georgia Mountains. 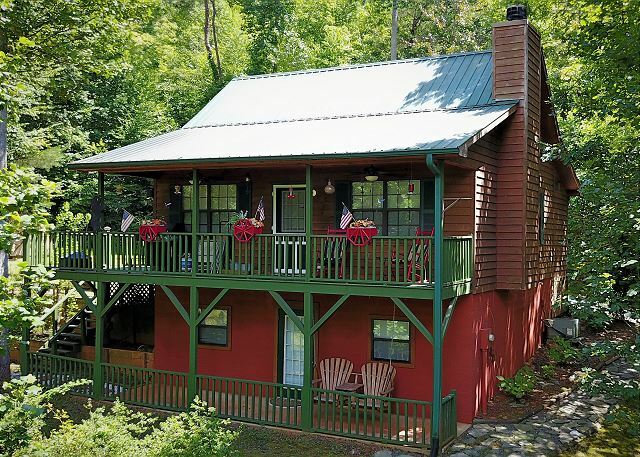 This beautiful cabin has 2 bedrooms and 2 bathrooms all on one level. Two sleeper sofas and a beautiful two sided gas log fireplace. Relax on the porch and enjoy the peace and quiet mountains of North Georgia. Great for those cool evenings in the mountains. Come and enjoy a relaxing weekend or week in the beautiful North Georgia Mountains. Sit back and relax and get away from the busy lifestyle. This cabin has a jetted tub and wood burning fireplace as well as satellite TV and full kitchen. It is a secluded log cabin with one bedroom off a great-room with a single bath. It has a two person limit, jacuzzi, central heat and air, Satellite TV, wood burning fireplace, and a seasonal view to the Southwest looking toward Blood Mountain. It is located up the mountain-side above three other cabins at elevation 2350 msl. It has all modern appliances and a King size bed. Bear and other wildlife visits are a common occurrence in the area at this popular honeymoon cabin. SPECIAL! Rent 3 nights and get the 4th night FREE! Limited Time Only! Sit on the porch and enjoy the sounds of the trickling waterfall as it winds its way through the property. 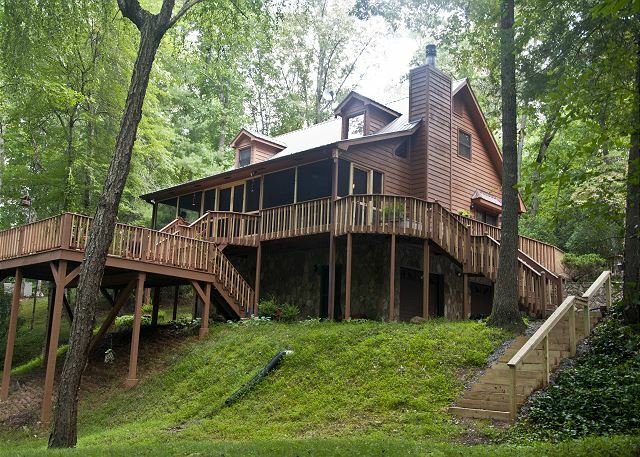 Beautiful, pet friendly 3 bedroom log cabin with lots of privacy, creek, pond, hot tub, pool table, internet access, outdoor fireplace, waterfall and is less the 2 miles to downtown Blue Ridge Georgia. This wonderful 4 bedroom/4.5 bath rustic retreat featuring 1.7+ acres, with paved driveway is the perfect place for your next vacation. Spend time in the hot tub and then enjoy a game of pool with the kids. 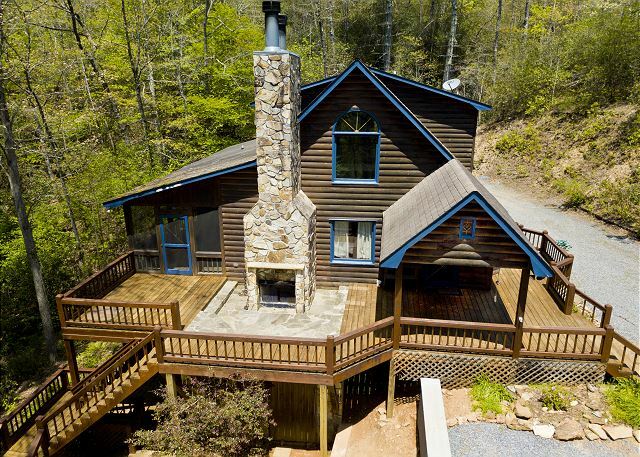 Upscale Log Cabin with long range winter and summer views of the North Ga. Mountains. Balcony has room for games and comes complete with outdoor gas grill, Adirondack chairs and picnic table. 2 levels of porches to soak in the yard and views. Local phone, washer/dryer, and gas fireplace. Outdoor wood fire pit (with seating) to enjoy the night air and plenty of space for the kids to play or adults to enjoy the fire flies. 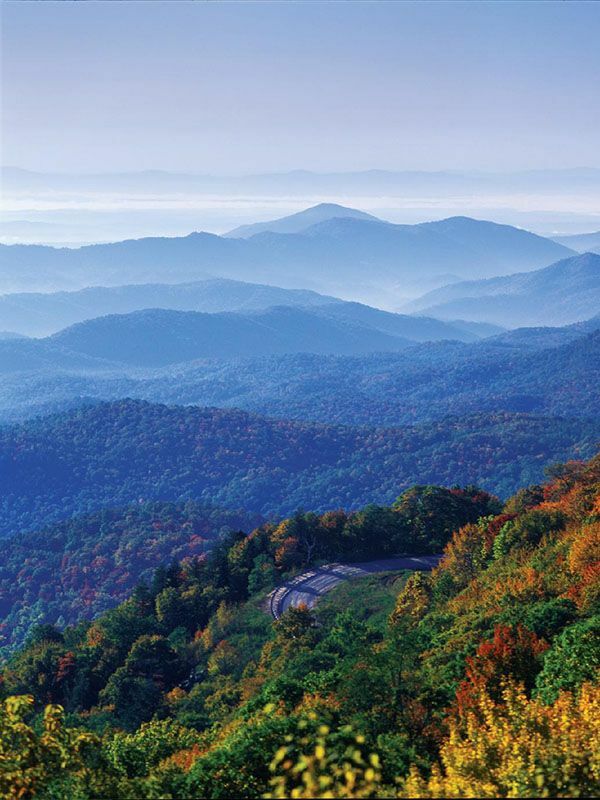 Just minutes from Vogel State Park and Brasstown Bald. Located close to Appalachain trail, numerous wineries and the tubing in the summers. Whether you are looking for adventure, family fun or just a peaceful escape Big Sky Overlook cabin is the place for you. Beautiful 3 bedroom upscale cabin with year-round mountain and lake views, hot tub, game room and much more. This cabin is located close to Hiawassee with amazing views overlooking Lake Chatuge and the mountains of north Georgia and North Carolina. 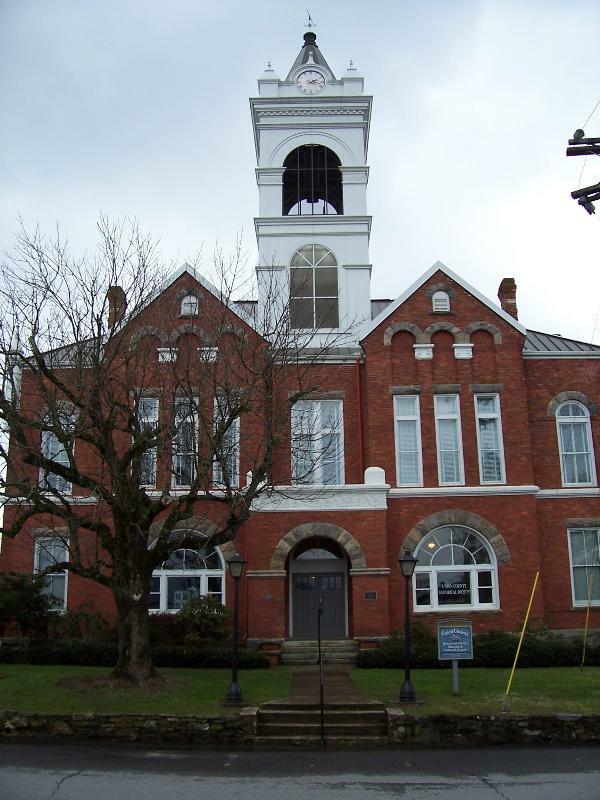 And it’s an easy drive to the nearby towns of Blue Ridge and Helen. Relax on either of the 2 large covered porches with your favorite beverage and soak in the beauty that surrounds this property. Enjoy some great fun time with the kids as you play ping pong or Air Hockey and maybe even try your hand at the Shuffle Board. Each of the 3 bedrooms has its own dedicated bathroom and direct access to the porches. After a long day of shopping at the boutique and antique stores in Hiawassee or boating (the Ridges Marina is conveniently located nearby), sit back and enjoy the relaxing warmth of the hot tub. This is a great place for fun and relaxation with the family! 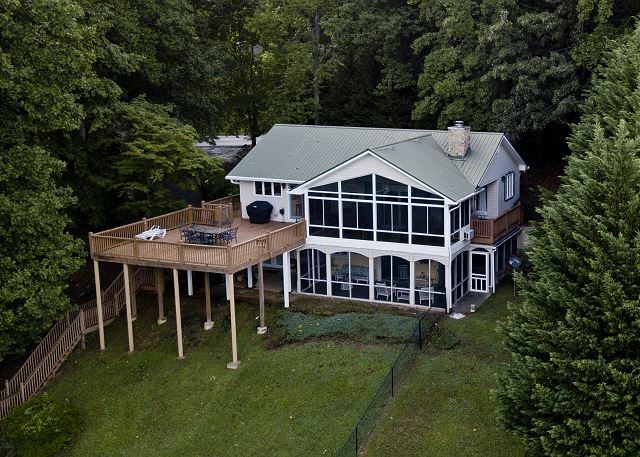 Pamper and Spoil yourself in this beautiful 4 bedroom 3 1/2 bath Luxury Home with breathtaking views of Lake Chatuge and the North Carolina and North Georgia Mountains. This Vacation Rental has it all! Hot Tub, Game Room, Internet, Mountain and Lake Views, Corn Hole, Waterfall with Koi Pond, Ping Pong Table, Den/Gameroom has Surround Sound System and Gas Log Fireplace. Living Room has gas log fireplace and views for miles and miles. Master bedroom on the main level has a King Bed and has access to the beautiful sunroom. Great place for morning coffee on those cool mornings. Two bedrooms upstairs with Queen Beds in each bedroom. There is also a nice play room or a room kids can sleep in for fun. Lower level has bedroom with Queen bed and access to the lower patio with the hot tub and koi pond and also features the game room with a ping pong table. Oversized kitchen with gas stovetop and oven, large island, lots of counter space and plenty of dishes as well as pots and pans for entertaining friends and family. 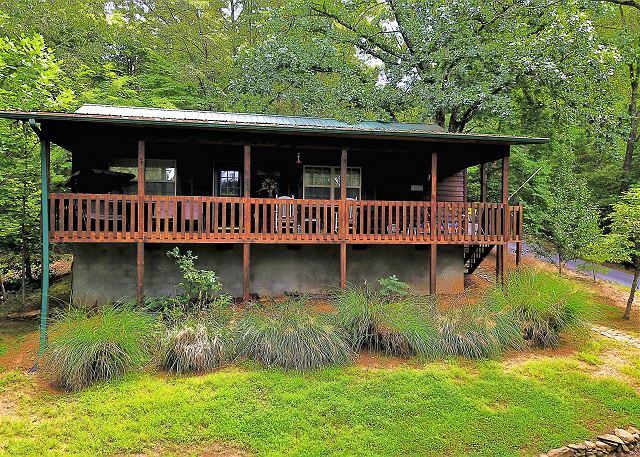 Beautiful Upscale Cabin with easy access, mountain views, hot tub, gas log fireplace, internet access and much more located near Young Harris, GA. Sit on the covered porch and enjoy the deer that frequent the yard. This nice cabin has a King bed in the master bedroom, two single beds in the guests bedroom and a queen bed in the lower level bedroom. This cabin is now Pet Friendly. Escape to the beautiful North Georgia Mountains and relax in this upscale mountain cabin with amazing mountain view. Beautiful 2 bedroom, 3 bath with, internet, screened porch this cabin now has an Air Hockey Table as well as an extra Queen Bed downstairs. Lower level is completely finished and available for additional sleeping, tv watching or just for taking a nap. If you are looking for a relaxing mountain vacation in a nice cabin in Blairsville, this is the place. Eagle Nest is truly a special cabin with amazing views and plenty of room. Great Mountain View 3 bedroom Cabin with covered porch and fire pit, covered porches with porch swing, and privacy with Beautiful North Georgia Mountain Views. Relax and enjoy nature and the mountains with your friends and family. Pet friendly cabin with easy access and end of the road privacy. Now with DirecTV satellite. TV in Living Room, Upstairs Master, and Lower Level den. 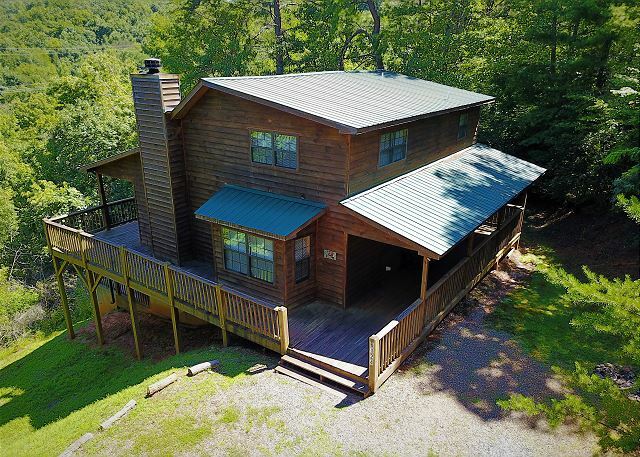 Beautiful 2 bedroom, 2 bath cabin with mountain views, internet access, pet friendly and has outdoor fireplace for the family to gather and enjoy the beauty of the North Georgia Mountains. 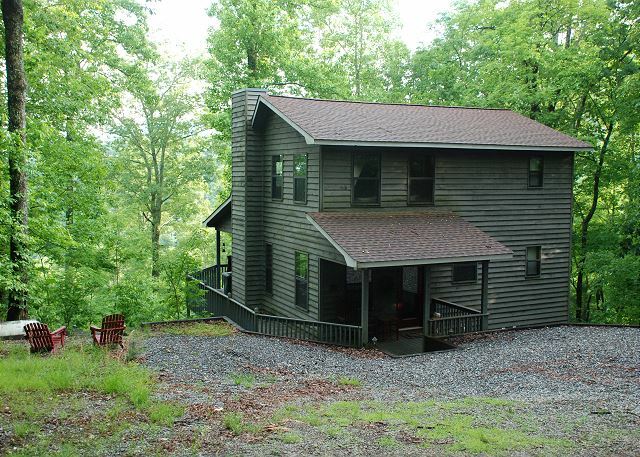 this cabin has privacy and has easy access and is located just minutes from down town Blairsville. Relax in this private cabin in the woods that is pet friendly located in the Track Rock area of Blairsville and North Georgia. Nice 2 bedroom 2 bath cabin in the woods. This cabin has a queen bed in the loft bedroom and 2 single beds in the main level guest bedroom. Jetted tub in the lower bath. Wireless Internet access, full kitchen, wood burning fireplace and lots of privacy. Relax in style and comfort. This Rental has easy access and has a private location. Great Mountain Getaway close to everything. Beautiful 4 bedroom vacation rental in the North Georgia Mountains. Great vacation rental with Pool Table, Pet Friendly, and sleeps 10 people easy. Located in Hiawassee Georgia and convenient to Lake Chatuge, Georgia Mountain Fairgrounds, Great restaurants and shops, and easy to get to. Great Get-A-Way for a romantic weekend with or without the kids. Awesome Mountain Views from this nice 3 bedroom, 2 bath cabin with Hot Tub, Ping Pong Table, and Air Hockey Table. Also has internet access and wood burning fireplace. 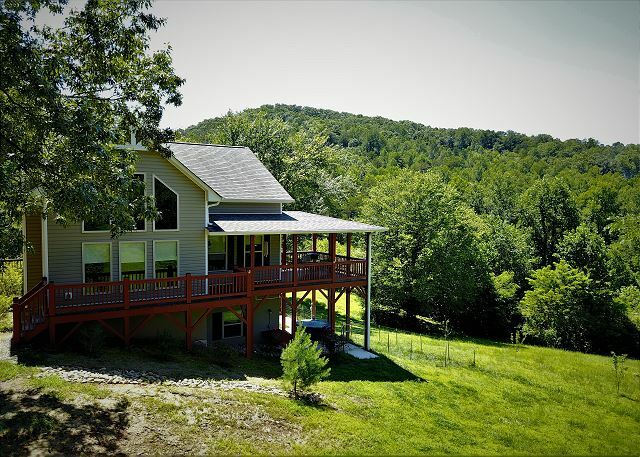 Nice 3 bedroom vacation cabin with mountain views, hot tub, game room, and internet access. King bed in master bedroom, Queen Bed in upstairs bedroom and 2 sets of bunk beds in loft bedroom. Getaway to the North Georgia Mountains and enjoy some of the great events that take place in the surrounding areas including the Georgia Mountain Fair, and much more. Beautiful 2 bedroom, 2 bath cabin in the North Georgia Mountains with Seasonal Mountain Views. 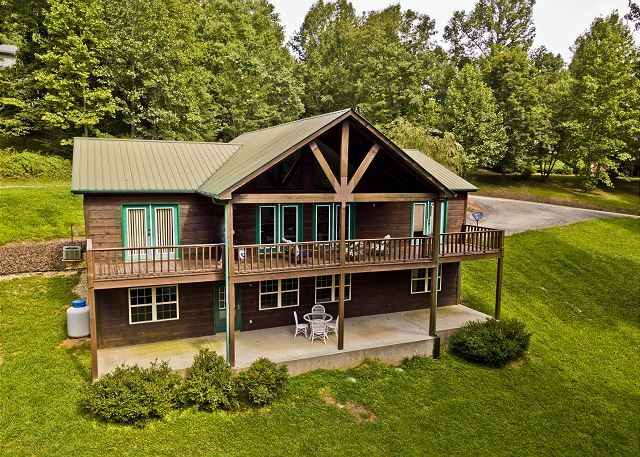 This cabin is conveniently located near Hiawassee. Nice relaxing porch with peace and quiet surroundings. Great place to just Relax and Unwind. This cabin has a full kitchen with an open floorplan. Great for when the whole family likes to hang out together and enjoy a nice vacation. 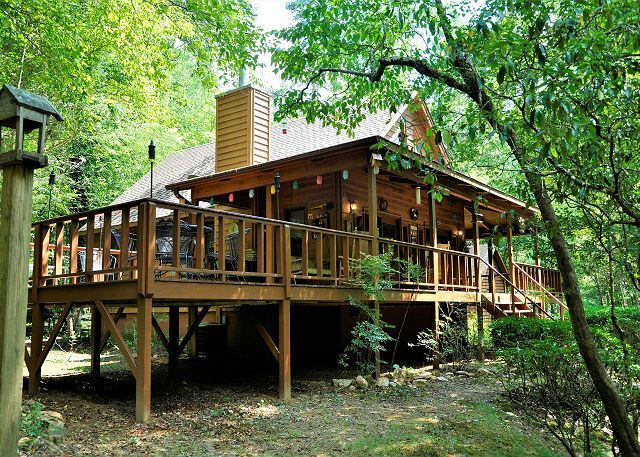 Cozy 3 bedroom cabin on Lake Chatuge with boat dock, internet, Pet Friendly, and much more. Spend a week here on the lake and you will want to come back again and again. Bring the kids and the grandkids and really enjoy a great vacation in the north Georgia Mountains. RELAX, UNWIND, and CHILL OUT! at Lake Chatuge. This is a great Mountain Getaway that is Close to town with easy access and plenty to do. Bring your fishing rods, boats and jet ski’s and just enjoy. If you love spending your vacation on the lake, this is a great spot. 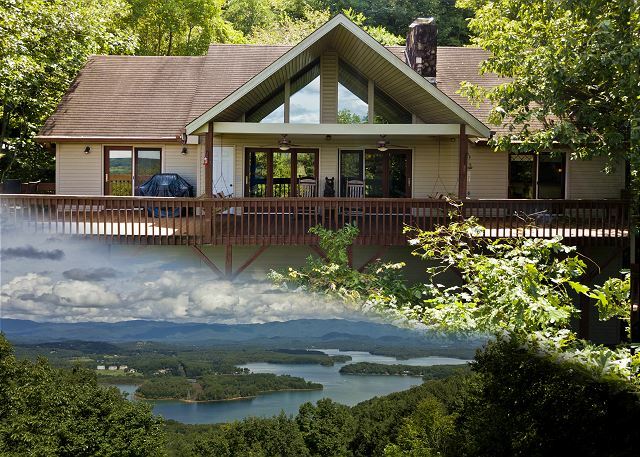 Relax in the 4 bedroom, 3 bath cabin on Lake Chatuge with boat dock, internet access, and much more. 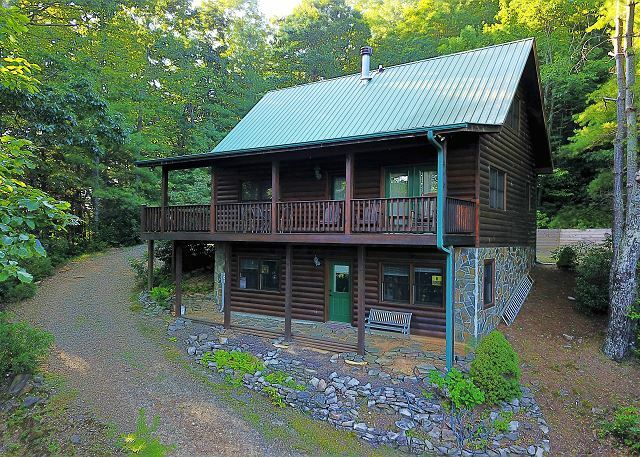 This cabin is located close to Hayesville NC, and Hiawassee, GA. Great Location with easy access and on one level. Bring Your Boat or Jet Ski’s and Enjoy Lake Chatuge. 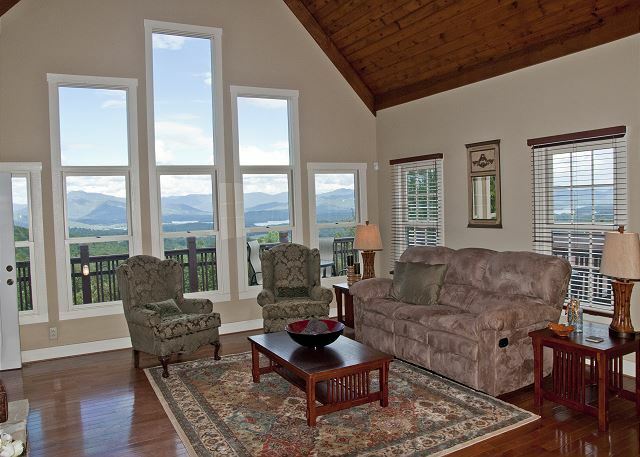 The huge great room has a big window for scenic views of beautiful Lake Chatuge and the North Georgia and North Carolina mountains. The quaint cabin is nestled in lots of trees for a private setting close to town. Relax and enjoy the 300 feet of lakefront property that surrounds the house and sit on the sandy beach just a few short steps from the front door. On beautiful sunny days, take the paddle boat for two out on the lake or hop in the kayak for up close views of the shoreline. On clear starry nights, sit on the swing by the fire pit perfect for marshmallow roasting. 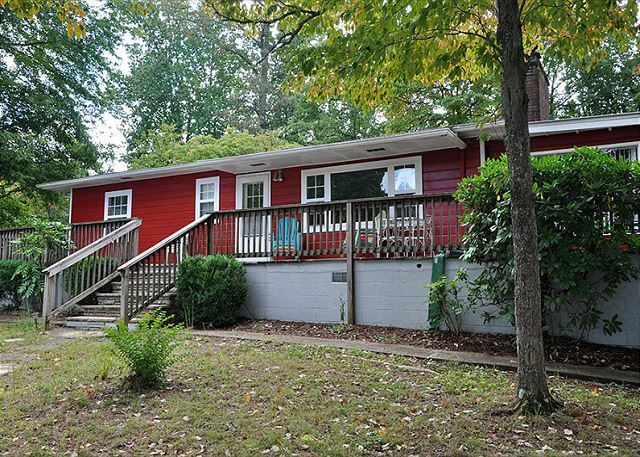 This beautiful rental property is located just minutes from Hiawassee, Georgia and the Georgia Mountain Fairgrounds. 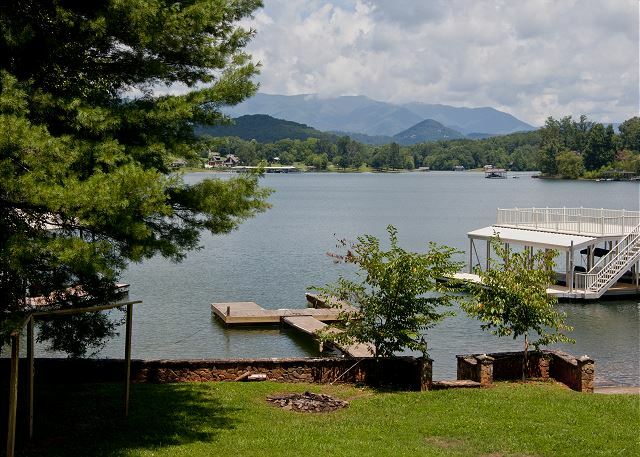 Easy access to Lake Chatuge and marina, restaurants, movie theater, shops, and much more. Relax and enjoy the beautiful views of Lake Chatuge and the North Georgia Mountains from this Get A Way in the Mountains. Enjoy the Piece and Quiet of this beautiful area with friends and family. You will want to come back again and again. Don’t forget, this is a pet friendly rental so you are welcome to bring your 4 legged friends. Fenced Yard. f you have been looking for a “Great Getaway Place” this is it!! Beautiful 3 bedroom 3 bath mountain cabin with year round mountain views and close to Lake Nottley. 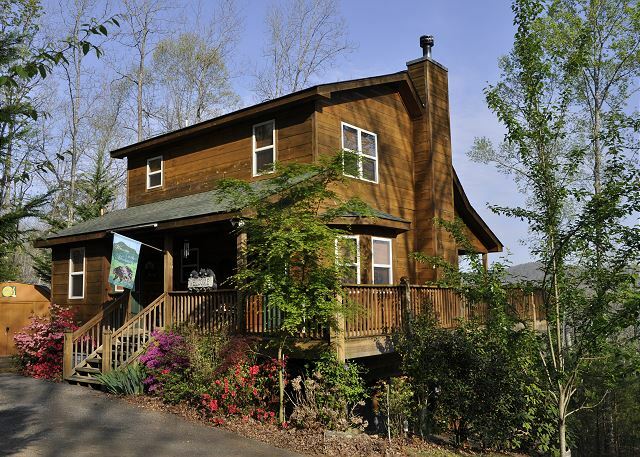 Great mountain getaway with internet access and real wood burning fireplace. Beautiful Mountain View Cabin! I Plenty of area attractions, white water rafting, trout fishing, golf, waterfalls, etc. Or just relaxing on one of the several porches. Just one visit one will convince you to come back year after year!! As you will see by reading our guestbook. Relax and enjoy the Beauty of the Trackrock area and the beautiful North Georgia Mountains from this nice log cabin with lots of space and Beautiful secluded, mountain views. 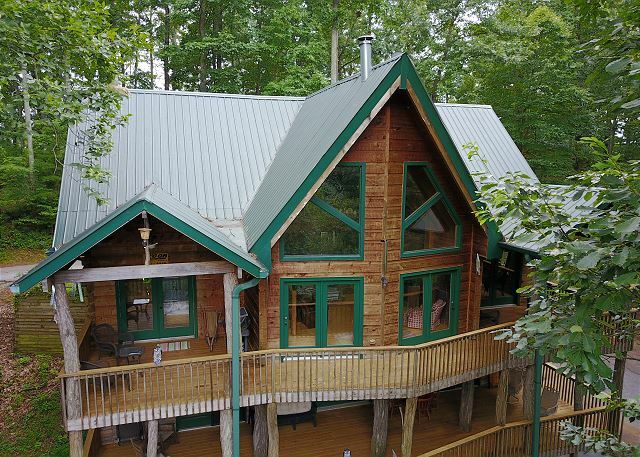 This Log Cabin has 3 bedrooms, and 3 baths with an additional sleeping loft for extra guests.This beautiful cabin can sleep up to 10 guests comfortably.Two bedrooms on the main level, one with a King Bed and the other with a Queen Bed. There is another bedroom in the lower level with a Queen Bed. Additional sleeping loft with a Full Size and a Single bed for extra guests. Downstairs level has large family room, fireplace, additional bedroom, with bath and laundry room.This also has large deck with access from bedroom and family room. Looking to have a memorable vacation? Over the Moon is your perfect choice. 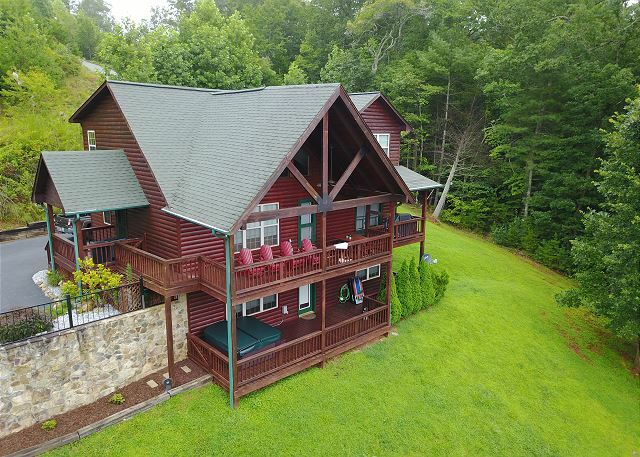 This cabin has jaw-dropping mountain views that greet you at this 4 bedroom, 3.5 bath cabin with plenty of parking for family and friends. This cabin has plenty of room with two master bedrooms suites, one secluded on the top level with a king bed and the other bedroom on the main level with a queen. The two other bedrooms are on the bottom level, with two bunk beds in one and two twin beds in the other. This vacation rental has lots of entertainment including a slate pool table, foosball, and xbox gaming system with a Bose surround sound system for everyone to enjoy. Finally, relax in the hot tub and enjoy the moon and stars! 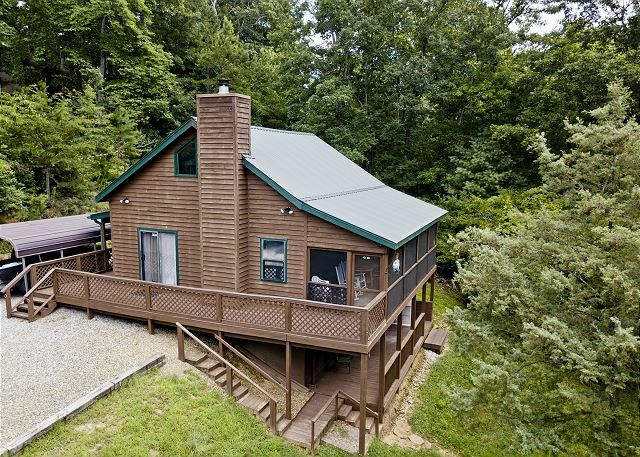 Get away to the beautiful North Georgia Mountains and Enjoy a nice vacation in the awesome 3 bedroom 3 bath cabin with mountain and lake views. This cabin also features and Hot Tub, Internet Access, Ping Pong Table, Big Green Egg, and wood burning fireplace. Awesome Mountain and Lake Chatuge views from this very nice 3 bedroom upscale vacation rental in Hiawassee, Georgia. 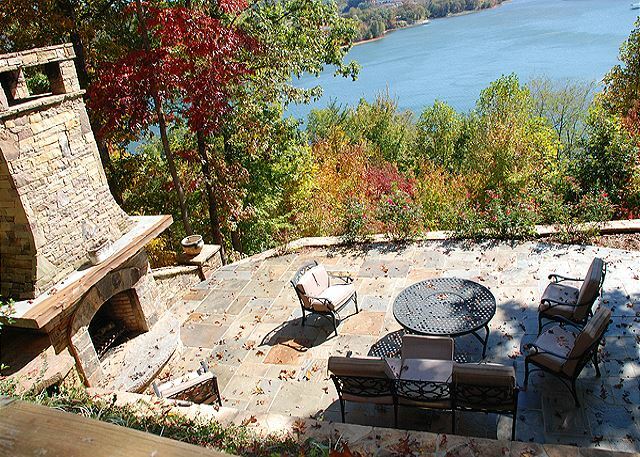 Relax on the large patio around the fireplace with friends and family and enjoy the beauty of the North Georgia Mountains and the beautiful views of Lake Chatuge. This will be an experience that will bring back fun memories for many years to come. If you like being inside, there is plenty to do. Nice Game Room with ping pong table, a large flat screen TV and you can enjoy some Wii with the family. Located just minutes from downtown Hiawassee. 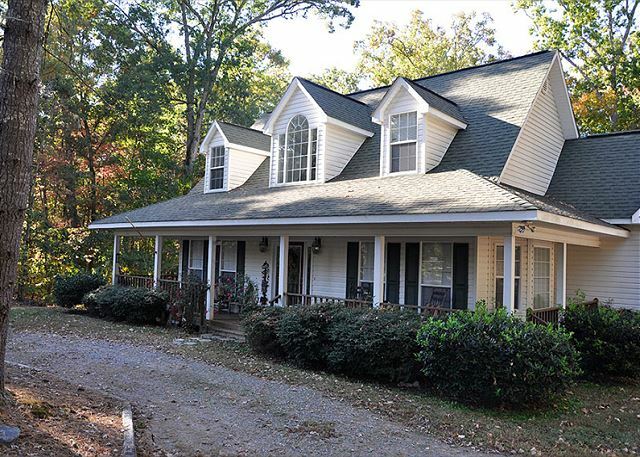 Beautiful and roomy 3 bedroom 3 bath cabin located close to Nottely Marina in Blairsville, GA. Great location with easy access and Pet Friendly. This cabin has two bedrooms and two bathrooms on the main level and a bedroom and bath on the lower level and also has a Pool Table and Foosball Table, internet access and Satellite TV. Large covered porch and handicap accessible ramp to enter property. The cabin has a queen bed in the master bedroom, 2 single beds in the guest bedroom and 2 single beds in the lower guest bedroom as well as a Queen Sleeper Sofa in the game room. This cabin is less than 1/4 mile from the Nottley Marina and it also has a creek flowing through the front yard just below the cabin. 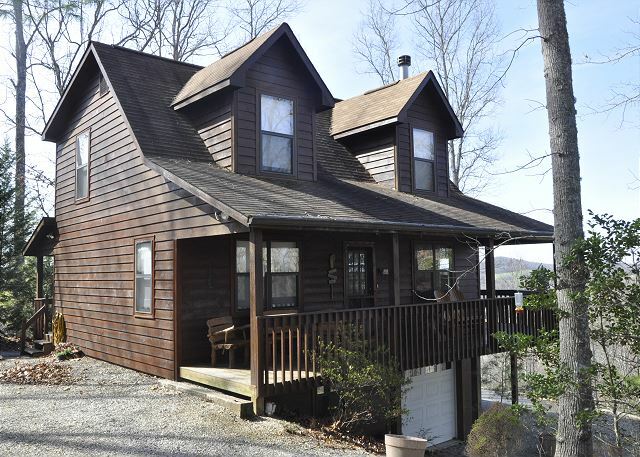 Beautiful 3 bedroom 2 bath cabin with wood burning fireplace, and does have a seasonal mountain view and is located less than 5 miles to downtown Blairsville. Enjoy the nice screened porch and the piece and quiet. This cabin has a queen bed on the main level and a queen bed in the upper level loft. This cabin also has a lower level bedroom that has a Full bed and a trundle bed, New Foosball Table and Soft Tip Dartboard in the lower level, and horse shoes located outside. Cabin does have internet access and is Pet Friendly with a fenced yard. Beautiful 2 bedroom cabin on the Nottley River. 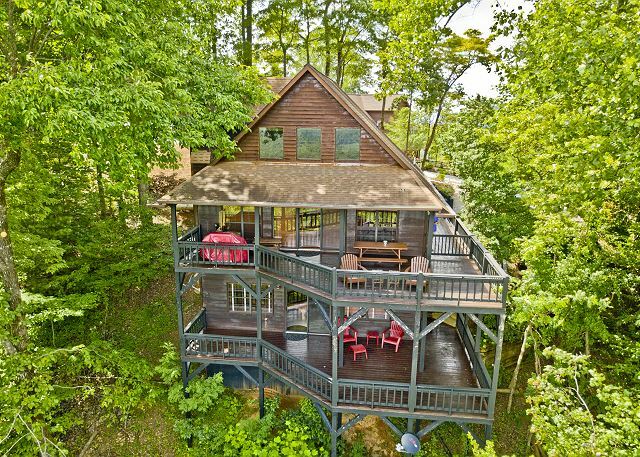 Relax and Enjoy the sounds of the rushing Nottley River just outside your door at this cabin. Sit on the banks and catch some trout or just sit in the swing and enjoy the sounds. The river is 30 feet from the back porch. Sit on the porch and let your troubles just float on down the river while you enjoy your morning coffee or evening beverage. Nice 2 bedroom 1 bath cabin with gas log fireplace, covered porch and some mountain views. 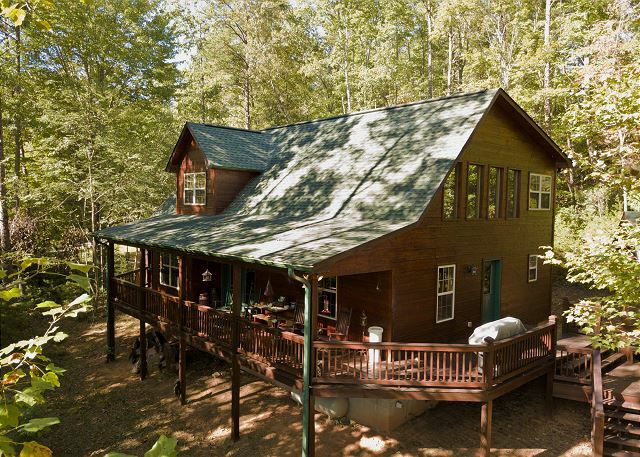 This cabin is Pet Friendly and located just minutes from Hayesville NC and Hiawassee GA. Enjoy the mountains in a nice clean cabin where you can bring your pet! Great Mountain Getaway. Enjoy the Grilling Porch with Gas Grill, Table and Chairs, or relax with the kids in front of the Fire Pit with some marshmallows. Want to spend a week in a nice cabin on the creek? This is the place to escape to. Get away and enjoy the beautiful North Georgia Mountains Beautiful upscale cabin on nice flowing creek with lots of yard. Great location near Hiawassee. This cabin has internet access. Relax on the screened porch and enjoy the sounds of the rushing creek. Plenty to do in the area including golf, shopping, boating, fishing, fairs and so much more. 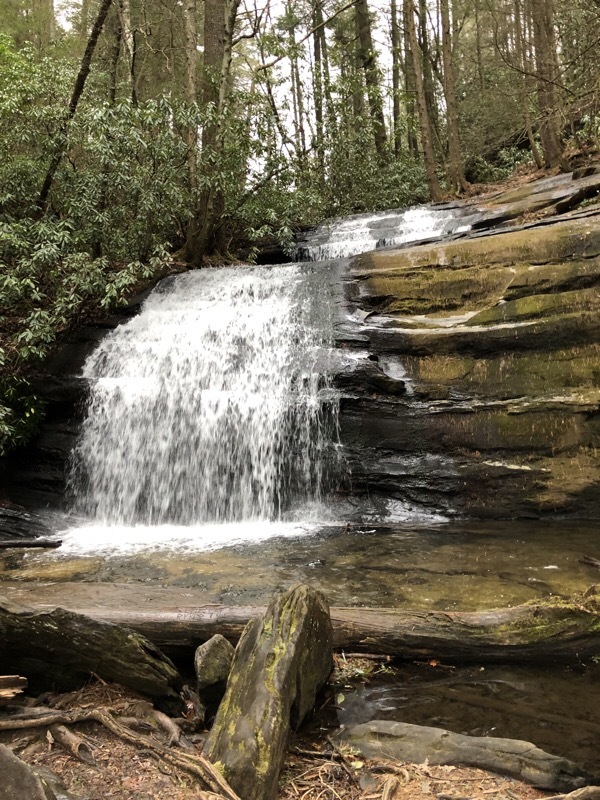 Relax and enjoy the privacy and the mountain views from this pet friendly cabin located in Blairsville and close to Vogel State Park and Helton Creek Falls as well as Brasstown Bald Mountain. 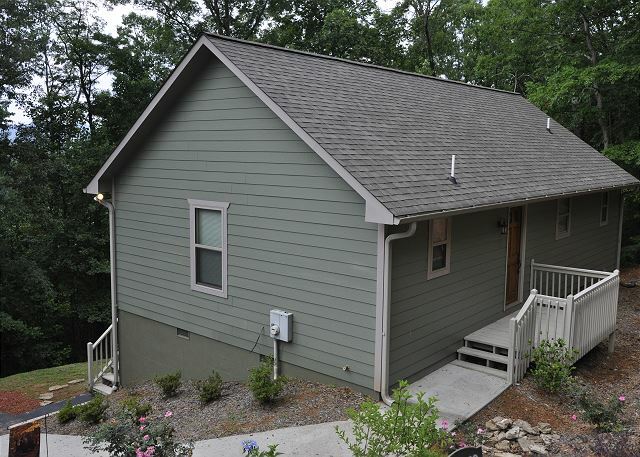 Beautiful 2 bedroom 1 bath Pet Friendly Cabin located near Blairsville, Georgia. Private location with Great Mountain Views. Wood Burning Fireplace, Covered Porch King Bed and Queen Bed. Majestic Mountain Getaways is a full service lease management company with over 13 years of Vacation and Long-term Rental Management experience. Contact us to learn more about our program and let your investment make you some money. Looking for Real Estate in the North Georgia Mountains or Western North Carolina Mountains? Let one of our Experienced Realtors help you in your Real Estate needs. Latest technology and the best Property Search Tool around. We value 100% customer satisfaction! Need to reach us? Give us a call or send an email and we will get back with you ASAP.